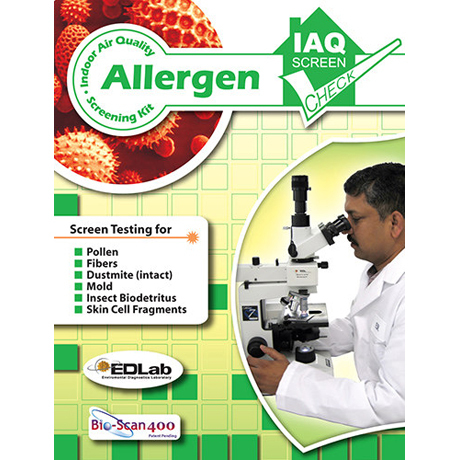 Air Quality Test / Allergen Test Kit - Only $72.99! This item is made to order and is non-returnable. Test kits are shipped within 1-4 business days. Once your sample is received by the laboratory, results are provided within 5-10 business days. Identifies and provides concentration levels for mold, pollen, dust mites (intact), skin cells, insect parts, fibers such as fiberglass, etc. Includes sample collection device for 1 surface sampling location. Price includes test kit, prepaid envelope, and lab testing. Get results by email within 1-2 weeks! The American Industrial Hygiene Association (AIHA) is an organization recognized by the federal government to set the standards for labs to ensure they are using the proper equipment and certified technicians.